So most of you will probably know that former footballer Cyrille Regis died suddenly on Sunday (14th January 2018) – he was just 59 years old. There’s no doubt that Regis was a pioneer for black British footballers – I can only imagine what he went through when he played, and had to listen to countless racists and hooligans as they booed, heckled and shouted monkey chants and other insults while throwing bananas onto the pitch. But from all accounts Regis faced this unbelievable vitriol with courage, dignity and skill. The words ‘hero’ and ‘trailblazer’ are bandied around far too much, but both of those titles are more than fitting for Cyrille Regis. During his time on the pitch he became a ray of hope for every black child in the UK who dreamed of escaping their reality and finding ways to reach their full potential. Regis was born in French Guiana (as it was known then) and moved to the UK with his family in 1962 when he was four years old, after his father Robert, who was a labourer from St Lucia, had emigrated a year earlier in search of a better life. Regis trained as an electrician and worked in that trade until he became a professional footballer. He was playing semi-professionally for Hayes when he was spotted by West Bromwich Albion’s chief scout Ronnie Allen and moved to the club in 1977 for an initial fee of 5,000. Regis was at Albion at the same time as two other black footballers, Brendon Batson and Laurie Cunningham, and the trio would later be nicknamed ‘The Three Degrees’ by their manager Ron Atkinson. Whilst at West Brom he also played in a testimonial match for Len Cantello which pitted a team of white players against a team of black players – the black players won 3-2! During his career Regis played for Coventry (where he won the only major cup of his career – the FA Cup in 1987); Aston Villa; Wolves; Wycombe Wanderers and Chester City. Regis had dual French and British nationality but chose to play international football for England – which speaks volumes! He made his debut for the national side in February 1982, becoming just the third black player to be capped by England at the highest level at that time, after Viv Anderson and Laurie Cunningham, but he only played in five international matches. After football Regis worked in various coaching roles before becoming an accredited football agent. In 2008, he was awarded an MBE. When Regis’ death was announced on Monday 15th January the number of heartfelt and glowing tributes showed what a difference he made to so many people. His former manager Atkinson told the BBC that Regis was “the best centre-forward”, but was “a better bloke than a player”. It’s so hard to describe how much of an impact Cyrille Regis and other black sportsmen and women had in the UK during the 1970s/ 80s when race relations were at an all-time low and racism was rife. I can only talk from my personal experience and say that I am beyond grateful for the pain and sacrifice they must have gone through in order to make it a little easier for the ones that came after them. The dignity they displayed, and the equality that they worked so hard for, did and does lift up countless black British children, who can only aim to leave a legacy as inspiring and enduring. Cyrille – thank you and sleep well. I hope 2018 is already exceeding your expectations and providing you with lots of hope for the future. The motivation for this post just came to me when I saw an advert on Facebook, and I felt that I had to share it because the product fits in with what I am trying to do with this site. The advert was for black history flash cards – a new resource offered by Urban Intellectuals for black children and adults, to inform them about their rich cultural and intellectual history which, as I have said countless times before, is not often recognised. I know if I had children I’d definitely buy them these cards, which are filling a shameful gap left by education systems around the world, because it’s obviously essential to educate our youth about black pioneers in many fields who have paved the way, (while sometimes facing seemingly insurmountable odds), for us to follow. When our children know their history they will become a confident, inspired and empowered generation who will know their worth and know that there is no limit to what they can do. I think the cards are a great idea and there are plans for more so I hope our community and others will support the initiative – spread the word. 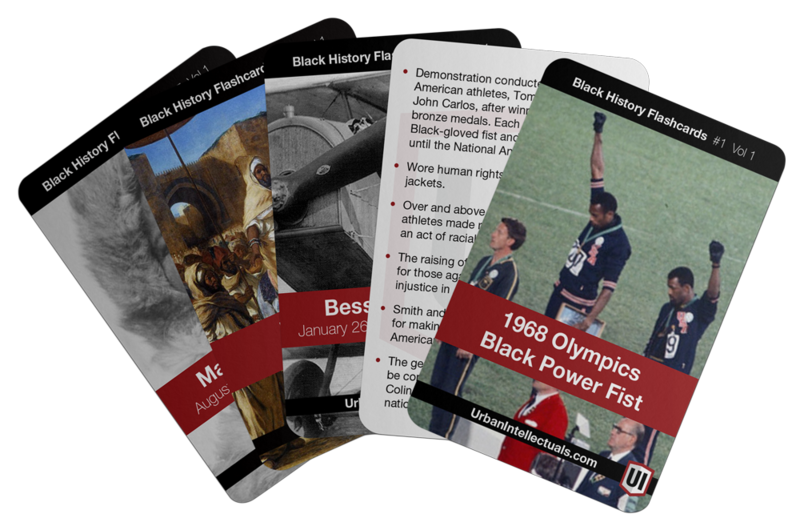 Click this link to take a closer look at the black history flash cards.